ABOUT THIS INTERVIEW: Ringo Starr collapsed and was hospitalized on June 3rd 1964 with tonsillitis. Jimmy Nicol was hired as a temporary drummer so that the 1964 Australasian Tour could continue as planned. Ringo was temporarily cured, and made his way back to the group in Melbourne on June 14th. His tonsils were later removed in December. Leaving for Australia from London Airport on June 12th, Ringo was very briefly interviewed by ITN-TV. When asked about his hospital stay, Ringo stated: "It was a drag laying there and watching the boys when they arrived in Holland... wondering what you're doing away from them." The next morning, while waiting for his connecting flight at San Francisco International Airport, Ringo was asked if he was planning on going out while in Australia. Ringo replied jokingly: "I'm going out. Don't worry about ME! Are YOU going out?" 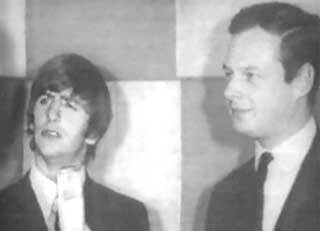 The following interview is Ringo's Australian arrival in Sydney on June 14th with manager Brian Epstein at his side. Starr and Epstein were in Sydney for just under two hours while waiting for their connecting flight to Melbourne, where Starr rejoined the group later that afternoon. Q: "Ringo, welcome to Australia. How do you feel about being here?" RINGO: "Oh, it's great. It's good fun, you know. I'm glad I'm off that plane." Q: "How long have you been on it?" Q: "Well, you must be... just about had it." Q: "How's your throat now that they put you in hospital and made you miss the start of the Australian tour?" RINGO: "The throat's fine now, you know. (jokingly, in hoarse voice) 'Everything's alright...'"
RINGO: "It's fine. Just gotta take it easy a few days and then we'll be back to normal." Q: "You're still able to bash the drums?" RINGO: "Oh yeah. Still bash 'em." Q: "And have you missed the other boys?" RINGO: "Yeah, terrible! Haven't half-missed you, fellas, if you're watching... or if you do watch." Q: "You're looking forward to joining up with them this afternoon?" RINGO: "Yeah, can't wait. 'Cuz you know, we've been together, you know, (elderly voice) for ninety years." RINGO: "For so long, I don't know. It's funny being without them. 'Cuz even if, you know, when we're not playing-- if we go out, at least two of us go out together as a rule. So it's a bit funny being on your own." Q: "Can you give us a look at these rings which you got your name from?" RINGO: (holds fist up suddenly to the reporters face) "There you go." Q: (laughs) "They say that fans have sent you alot." RINGO: "Uhh, not too many actually. No. (comically) I haven't got two-thousand six-hundred seventy-one as some reporter wrote." Q: "What are you looking forward to most seeing in Australia?" RINGO: "I don't know. Everything in general, you know. Glad to see a few Maoris and that. And a few kangaroos, I suppose." Q: "And Brian, coming over to you. Can you tell us when you first met The Beatles?" 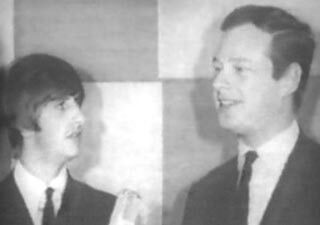 BRIAN EPSTEIN: (laughs) "Oh, 1961. October, I think." Q: "And whereabouts did you see them?" BRIAN: "In the Cavern Club in Liverpool." Q: "And what did you think when you first saw them?" BRIAN: "Oh, I was sufficiently knocked out." RINGO: "Load of rubbish, that's what you told me." Q: "And what was the next step from there?" BRIAN: "Well, then we got to know each other and eventually worked out a bit of idea of management." BRIAN: (jokingly, to Ringo) "See?" Q: "At any time did you have a feeling that you might reach this dizzy height of success that you..."
BRIAN: "No. Well, I don't know about the dizzy height, but I always thought they were going to be pretty big. Very big." Q: "What's the hardest problem you encounter trying to manage the Beatles?" BRIAN: "Well, none really. But I think traveling around and going around the world and making arrangements for moving around is the most difficult thing, 'cuz you don't know what's going to happen." Q: "Do you have any trouble keeping them in control? Do they try and escape from you?" BRIAN: "Oh no-- (laughing) No no no no no." Q: "And on the subject of money, how do you go about financing their weekly pocket money? What happens about that?" BRIAN: "Uhh... They get, you know, whatever they want from their earnings, and their earnings go into their own company." Q: "And Ringo, do you miss anything now being a Beatle-- or do you think you've got everything now?" RINGO: "Umm, no. I don't miss anything, you know. Well, I can't remember. I just have a good time. It's good fun, you know." Q: "Yesterday in Adelaide, the three were talking about what they were gonna do when they weren't Beatles. And they said you were going to open a chain of women's hairdressing salons. Is that correct?" RINGO: "Yes. Well, I thought of that a few months ago, you know, so I'm still thinking about it. But I could change. Oh, I could change, you know." Q: "Is there anything that you'd like to ask about Australia?" RINGO: "Ask about? No, I don't think so. Seems quite nice to me." Q: "So, it was quite a good reception." 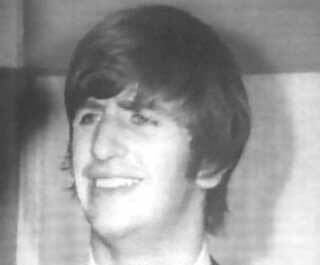 RINGO: "It was a marvelous reception, I loved it. How many were there?" Q: "I think it was about three or four thousand." Q: (long pause, then to film crew) "...how are we doing?" RINGO: (looking into the camera, regarding the reporter) "He's getting worried now, isn't he? He's run out of questions!!" RINGO: "Doesn't know what's happening! (jokingly, to the reporter) Have you been at it long?"